Is it just me or did this year go by too fast? Here we are at the end of 2010. I wanted to take a moment this morning to look back at the goals I posted last January in my "Look ahead: 2010" post. I'm proud to be able to say we completed them all! Progress: 350/990 - COMPLETED! We easily met this goal and currently have 363 signed 2008 Topps cards. Don't tell anyone but that number is unofficially even a little higher. I have a stack of cards sitting here on my desk that I need to scan and do a post for. 2008 Topps Opening Day - COMPLETED! I was hoping to have 10 signed Opening Day cards by the end of the year and we got 13! Custom Cards - COMPLETED! Custom Card Sunday kind of fizzled out mid-summer but not after I posted 20+ custom cards. I have a few more that I created but never made their way to the blog. I wouldn't be too surprised to see a resurgence sometime in 2011. Keep My Blog Alive - COMPLETED! 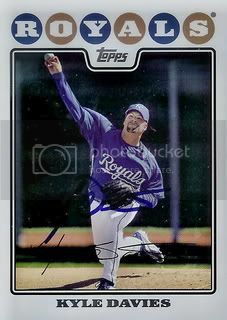 We hit a dry spell in June when we only had 2 posts in three weeks but My 2008 Topps Set Blog came back strong in July and we averaged over 20 posts a month for the rest of the year. All in all it was a good collecting year. I had a great time watching baseball and getting autographs during Spring Training and the Arizona Fall League with my dad & son. Can't wait for next year! Added a few more Refractors to our collection. Hopefully we can get a few of them signed. 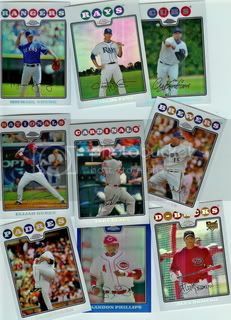 My favorite out of these nine is the Brandon Phillips Blue Refractor. Got a nice Christmas present from the 2010 American League MVP. 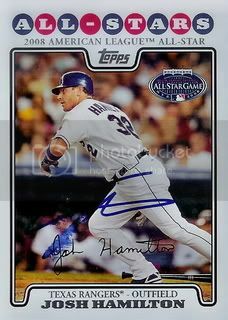 Josh Hamilton signed his All-Star card from the 08 Topps set for our collection. I was a surprised to get this one back after the monster year Josh had. I'm glad to know he hasn't forgotten about his fans. 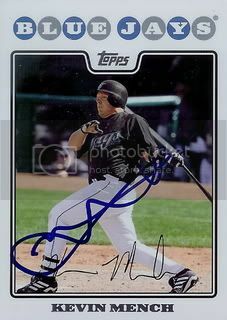 He's been one of my favorites since he played in the Arizona Fall League in 2001. Getting this card totally made my day. 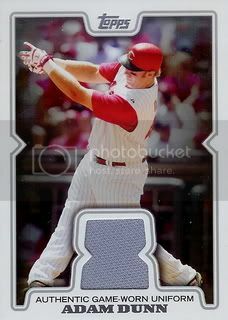 We recently added this Adam Dunn jersey card to our 08 Topps collection. We have at least six cards from this insert set. I'm pretty sure there's a seventh one around here somewhere too. 2009 National League All-Star, Ryan Zimmerman signed a card for our set. We recently sent Ryan an autograph request along with a small donation to his charity, ziMS Foundation. Ryan's charity helps raise money for families effected by Multiple Sclerosis. If you're interested in organizing you're own charity events, visit socialworkdegree.org for some helpful resources. Pretty cool to get an autograph from a current star through the mail. Our friend, Raiderdan, sent us a lot of signed 08 Topps cards this year. We're very thankful for all of his contributions to our set. 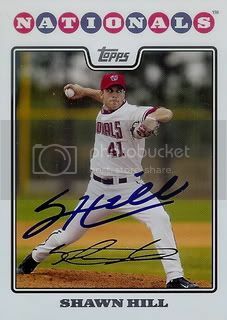 The latest card he sent over is of Washington Nationals pitcher, Shawn Hill. I thought Shawn has a pretty cool autograph. Glad to have this great looking card in our collection. Here's our second signed gold border parallel card. This one is of former New York Mets catcher, Ramon Castro. Here's another card my dad bought for our collection. 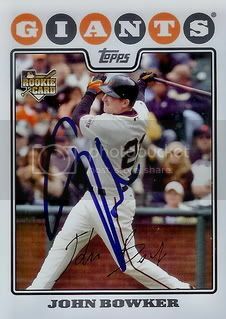 It's a certified autograph of Oakland A's first baseman, Daric Barton. These were inserts in Series 1 of the 08 Topps set. Thanks again, Dad! My dad gave this one to me as a present for my son a few weeks ago. 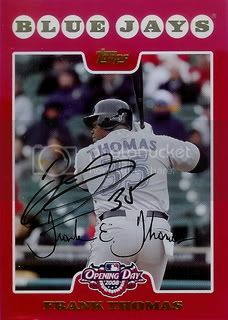 Frank Thomas was always one of my favorite players growing up. Another nice card for our collection. Thanks, Dad! 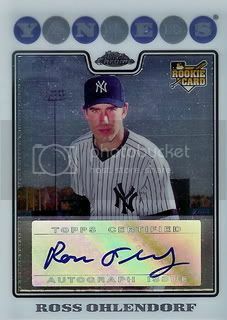 Another day, another signed 08 Topps card. This one is of former Giants infielder, John Bowker. John is now with the Pittsburgh Pirates. In other blog-related news, I just got the prize for our first contest. It was donated to us by the fine folks at Atlanta Sports Cards. I'm still debating on how I want to give it away. Right now I'm shooting for something simple beginning on New Year's day. 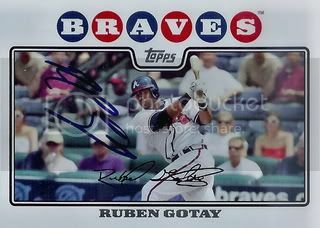 We got this Ruben Gotay card in a trade with a friend on SportsGraphing.com. 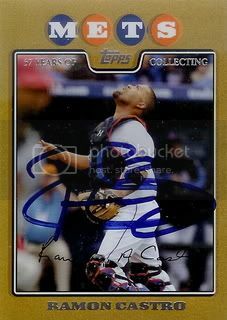 Looks like Ruben signed it sideways. Former Texas Rangers slugger, Kevin Mench spent most of 2010 with the Syracuse Chiefs. That's where a friend got this card signed for us. Kevin was called up near the end of the season and played in 27 games for the Washington Nationals. 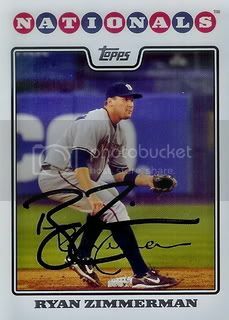 I liked the Brian Barton Chrome auto I picked up last week so much, I wanted to get another. I bought this Ross Ohlendorf off eBay for $2 and free shipping. 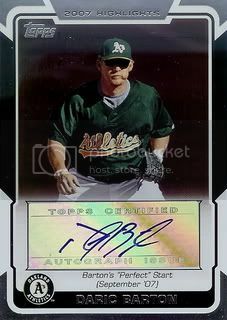 A friend from SweetSpotGraphs.com was able to get us a few 08 Topps cards signed last season. His home team is the Kansas City Royals so all four cards are of players who were on the Royals at some point last year. 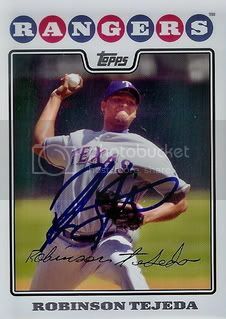 The final card is of former Texas Rangers reliever, Robinson Tejada. Tejada has been with the Royals since June 2008 when they claimed him off waivers from Texas. Next up is Royals starting pitcher, Kyle Davies. 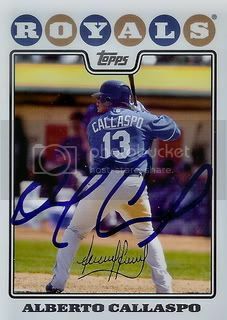 The second card is of infielder, Alberto Callaspo. Alberto started 2010 with the Royals but was traded to the Angels in July. 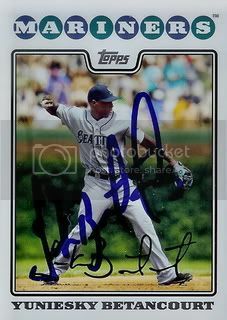 First up is former Seattle Mariners infielder, Yuniesky Betancourt. 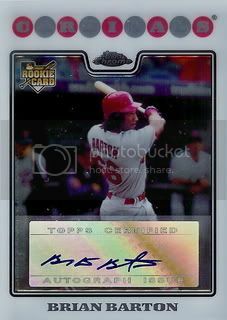 It's been awhile since we've added any of the 08 Topps Chrome certified autographs to our collection. We recently picked up this card of St. Louis Cardinals outfielder, Brian Barton.